This lesson introduces you to the two visible and one of the near-infrared imager bands on the GOES R-U ABI (Advanced Baseline Imager), focusing on their spectral characteristics and how they affect what each band observes. Also included is a brief discussion of the customization of visible enhancements as an important consideration for improving the depiction of various features of interest. 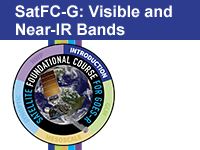 This lesson is a part of the NWS Satellite Foundational GOES-R Course.